This research is being conducted in collaboration with the engineering department at Notre Dame, and with the hopes of being able to apply it to the rehabilitation of patients suffering from apraxia. Apraxia is a difficulty reaching to objects that occurs commonly following a stroke. Example of the Brentano Illusion. In all three lines, the two halves are the same length. Reaching for an object requires defining its location relative to one’s body (egocentric reference frame) or other objects (allocentric reference frame). To investigate the relative contributions of these reference frames, participants use a robot arm to reach toward targets embedded within the Brentano visual illusion at various points on a computer screen. The strength of the allocentric frame is indicated by the magnitude of the illusion across all trials. 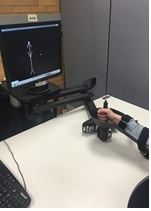 We manipulate whether a cursor showing the movement path and the participant’s hand is visible, and whether the illusion and target on the screen is visible during reaching. Participants make less accurate reaching movements when their hands and the cursor are obscured, illustrating a stronger effect of the illusion and an increased reliance on the allocentric frame when the egocentric frame is unavailable. This research contributes to our understanding of how these frames are coordinated during reaching. We hope to use our better understanding of how reference frames are coordinated during reaching to assess and individualize therapy for patients with apraxia.